..Can be found right here! Need to know about motorcycle half helmets? If you've read my article on cheap motorcycle helmets, you should realise by now that I am a big fan of DOT/Snell/ECE 22.05 approved motorcycle helmets. Particularly Snell certified helmets. And there are no half helmets on the market that are Snell certified. So in the interests of praticality here is what you need to know about motorcycle half helmets. Incidentally, if safety is a major consideration for you (and it should be) but you don't want a full face helmet, why not consider an open face three quarter helmet? There are Snell Certified open faced helmets available, and I will list them at the end of the article, so keep reading! If you're a fan of motorcycle half helmets, that's fine, but make sure you buy one with decent quality, DOT approved, and not the GI joe Toys R Us versions. Be aware that you are sacrificing a level of protection by opting for a half helmet. Make sure you ride accordingly. 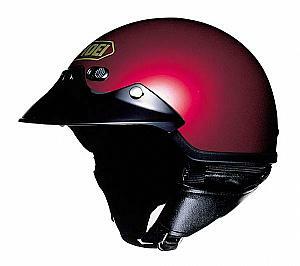 Check any accessories (snap on visor, ear muffs) are actually usable before you buy any motorcycle half helmet. Why pay money for something you can't or will never use? If you get very hot and sweaty in a helmet, look for motorcycle half helmets that have air vents (yes they do exist) for exampe the Vega XTS helmet. If you buy one, wear it. On every ride. The time you decide to take a ride down the block to the gas station for something may wel be the time you have a rear end. With a helmet you stand a chance. Don't become a statistic! Keep checking back as I will try to add to this list of Snell Certified open face helmets for those of you looking for an alternative to motorcycle half helmets.